Previous post: Definitely a book that will keep you out of the woods. Next post: Happy Fourth of July, everybody! I love P.J. O’Rourke‘s writing, and I love Antoni Gaudi‘s architecture, and when the first wrote about the second in the September 2011 issue of the Atlantic Monthly I nearly expired from delight. This is Gaudi’s Casa Battlo. What is admired as whimsy could be awful as fact—real slithy toves in an actual wabe. The shapes of 21st-century architecture are increasingly whimsical. (Two words—Frank Gehry—suffice to describe the trend.) I’ve been looking at flighty modern buildings in Los Angeles, Shanghai, London, and Dubai. They put me in mind of the Barcelona architect of a hundred years ago, Antoni Gaudí. And they remind me why, although I am entranced by Gaudí’s work, I’ve always been reluctant to go see it. Finally I give in. Maybe an inspection of Gaudí will help me understand the new oddball global cityscapes. The exemplarily fantastical Casa Batlló, from 1906, is a six-story townhouse on Passeig de Gràcia, which is very much Barcelona’s Park Avenue. The roof is an ocean swell thickly rippled with ceramic tiles that undulate in colors as well as curves. 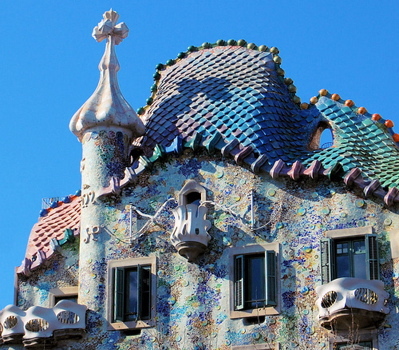 Vertical waves, gentle rollers, shape a facade encrusted with the mosaic technique Gaudí developed, trencadís. Hundreds of thousands of bright bits of china and glass are splayed in clumps and bunches: flotsam and jetsam (or a bad sun rash) as ornament. Interspersed in the trencadís, decorating the decor, is a picnic litter of plates splashed in motley glazes. Columns on the lower floors are modeled on human bones. Each props open a whale-jaw rictus of cast concrete. The upper-floor balconies are sheet metal hammered into pelvic girdles with strips of twisted steel like seaweed fluttering from each hip. The effect should be Casa Davy Jones’s Locker. But Casa Batlló is beautiful. And it fits right into the neighborhood. Only a genius could have pulled this off. Once in, I want to move in—aspirationally and kinetically. The hall streams. The stairs surge. There are no edges, no corners. Walls glide into ceilings. Rooms flow into rooms. It is a peristalsis house. But light, cheer, air, and comfortable proportions are everyplace. The design is meant fully for people and, what with all the tourists, is full of them. They are in good spirits, as the spirit of the house demands. Every detail is crafted to delight. Even the air shaft is a masterpiece, tiled in shades of azure, deep-tinted at the top and gradually lightening to spread sun evenly to all floors. I, too, have been to the Casa Battlo, and I, too, wanted immediately to move in. O’Rourke is right, it is impossible to be anything but delighted and cheerful in one of Gaudi’s houses, or even just happening on one on the street, as you are prone to do in Barcelona. This is Gaudi’s La Mila, known better as La Perdrera. 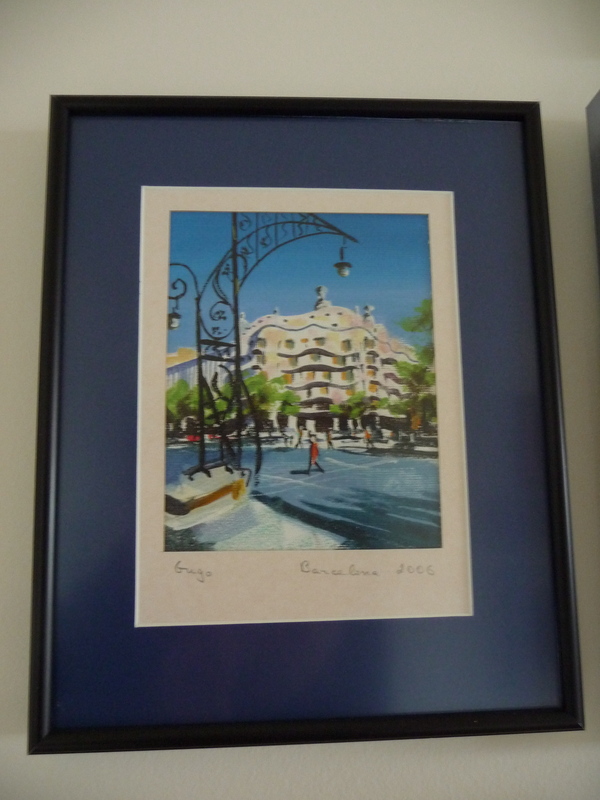 My favorite keepsake from my visit to Barcelona was a little drawing of La Perdrera I bought from a street artist. The first time I saw La Perdrera was at night. My jaw dropped and I stopped dead in my tracks, as the Barceloni detoured tolerantly around me. They’re used to it. You should definitely read this piece. And you should definitely go to Barcelona and allow Gaudi to seduce you in person. And if you can’t get to Barcelona just yet, check out this online Gaudi shop. Come on, how can you not love the bull? I’ve been there too! Barcelona 1995 – all alone to wander the streets day and night and discover these fantastical buildings. And what about La Sagrada Familia – the Gaudi cathedral under construction for a lifetime. It wasn’t finished then (is it now? ), but open for tours. I’ll never forget the view from the top – both of the scenery of the city, but of the almost-within-reach tile-covered rooftops of the building itself. Thanks for sharing, Dana, and for reminding me to dig out my own non-digital photos and post them. Dana I absolutely love your comments on everything, how on earth do you find the time? Are you sure you’re not at least identical triplets? Never mind the books, the beadwork and delicious recipes too!